Frank Antonicelli’s New Book “Know Your Enemy, Taking the fight to cancer” is a Telling and Inspirational Guide Through the Complicated Path of Cancer. 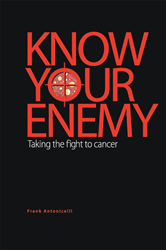 Recent release “Know Your Enemy, Taking the fight to cancer” from Page Publishing author Frank Antonicelli is an essential read for first time cancer patients, family members, friends and even co-workers of anyone diagnosed with cancer or other terminal diagnoses. Frank Antonicelli, a management consultant, founder of Public Safety Information Consulting, Inc., previous public sector marketing representative and systems integration specialist for IBM, classic corvette and sports enthusiast, coach, golfer, poet, NASCAR fan, devoted writer and author, has completed his newest work “Know Your Enemy, Taking the fight to cancer”: a gripping and potent journey of coping with a loved one being diagnosed with cancer. “Frank’s willingness to openly share his family’s struggle with cancer is to your benefit. You’ll find yourself saying, ‘Me too. That’s exactly what I’m feeling,’ quite often. If this book was available when my brother successfully fought stomach cancer, ten years ago, it would have made things much easier for our family,” said reader and fan Pete Weaver. Published by New York City-based Page Publishing, Frank Antonicelli’s poignant tale aims to inform and empower anyone effected by cancer. “We hear the word cancer and we enter a new and frightening world. We reach for our faith, the support of our family and friends, and another vital ally—knowledge about the path to come. Mr. Antonicelli has written a terrific book that helps us find that path. Lots of good information and advice and encouragement fill its pages,” said Kathryn Peroutka, MD. Readers who wish to experience this inspiring work can purchase“Know Your Enemy, Taking the fight to cancer” at bookstores everywhere, or online at the Apple iTunes store, Amazon, Google Play or Barnes and Noble. Fifty percent of the profits from the sale of this book will be donated to the following cancer-fighting organizations*: PinnacleHealth Foundation; Cancer Navigators, Inc.; NavigateCancer Foundation and EmergingMed¾two LIVESTRONG support groups; and The Block Center. These organizations help individuals affected by cancer identify the information and resources available to aid them in their battle against this enemy.